Professor Mayes served on the Arizona Corporation Commission from 2003 until her term expired on December 31, 2010. 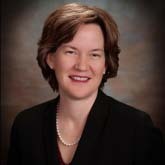 She helped co-author the Arizona Renewable Energy Standard, which requires that by 2025 utilities must generate 15 percent of their overall energy portfolio from renewable sources, like wind solar, biomass, biogas, geothermal and other technologies. The Standard contains the most aggressive distributed generation requirement in the country, requiring utilities by 2011 to acquire 30 percent of their energy from residential or non-utility owned installations, like rooftop solar panels on someone's home or on a shopping mall. She also helped establish one of the most ambitious energy efficiency standards in the nation, requiring utilities to sell 22% less energy by 2020 than they would have under current forecasts.